of Bradford Road, Ancoats, Manchester. Built in Bradford Road alongside the Ashton Canal, this 1840 building was designed by David Bellhouse. 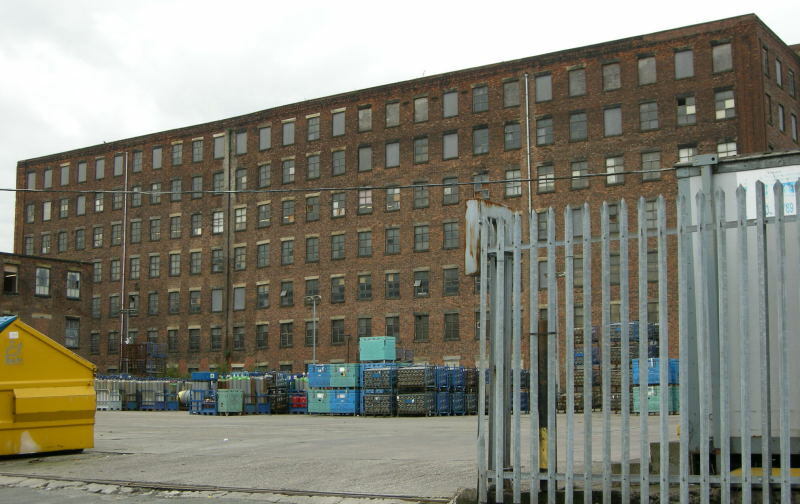 Its seven storeys had 35 loading bays facing directly onto the canal as well as front warehousing facilities. The Brunswick Mill was one of the largest in Britain at that time and by the 1850s held some 276 carding machines, and 77,000 mule spindles. Referring to the 1848 O.S. map, on the other side of the canal was a 'brick field', beyond which were Holt Town Mills. The building adjacent to the canal towpath was 100 yds long, and behind this were other buildings surrounding a courtyard. Immediately south west was the slightly smaller Bradford Road Mill, and beyond that was Beswick Street, which crossed the canal by Harbottle Bridge. Goad's Insurance Plans for Manchester, Sheet 213 dated 1928 (updated 1943) shows that the mill was largely occupied by Lancashire Cotton Spinning Corporation as a spinning mill, although part of the mill, in the Bradford Road wing, was used as a shirt factory by Henry Bannerman and Sons. The plan shows a 100 ft high octagonal chimney at the S.W. corner. Across the canal was P. McGrory’s Star Cooperage, and north east of that was the works of the Washington Chemical Co, which produced liquefied CO2. South west of McGrory’s cooperage was the Wellington Mill of Bazley Brothers, with its 150 ft square chimney. 2014 The impressive mill buildings still exist. This page was last edited on 15 January 2016, at 15:39.